Cologne is kind of a standard men's gift, I know. But this is one I really like, and is approved by bf too: L'Occitane Cèdre & Oranger Eau de Toilette ($85 CAD). (Side note: should I just call him by his name and new readers just assume it's my partner? Should he get some kind of code name? Mr. Judo perhaps? :P Anyway.) The citrusy and woody scent--owing to the main notes of orange and cedar wood, plus a little pine--is fresh and clean. It's a great everyday fragrance and easy to wear. FYI although it's not available online, I've also seen gift sets in store with the full-sized eau de toilette packaged with matching shaving cream and shower gel. Fancy up his morning routine with the Balsem Grooming Essentials Kit ($85 CAD). It covers all the basics: moisturizer, shampoo, and shave cream in minimalist packaging, plus a handy dopp bag to keep it all in--perfect for toting along when your guy is staying over for the weekend. If you want to upgrade just one part of his routine, these items as well as hair styling products are available for $24-28 separately. The team at Balsem sent over a few items to try, and so far bf really likes the shaving cream, which he says is much better than his usual drugstore shaving cream. 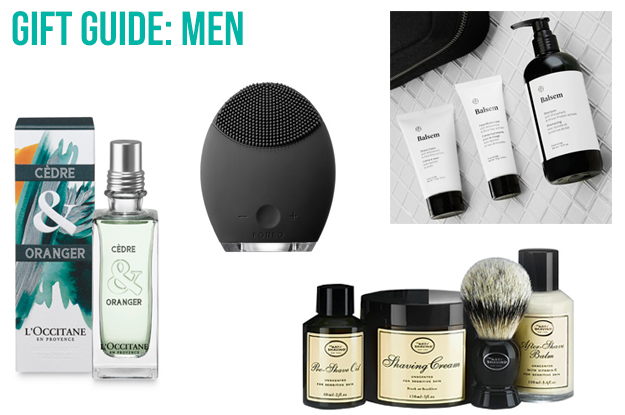 Want to make his daily shave a luxurious ritual? Check out The Art of Shaving 4 Elements of the Perfect Shave Kit ($170.50 CAD), which has everything (except the razor) to do just that in four steps: pre-shave oil, shaving cream, a badger shaving brush, and after-shave balm. The "Starter Kit" version is cheaper, but the brush looks different--I suspect it's not as good quality as the Pure Badger Shaving Brush available in the kit above, and also sold separately at $85.25 CAD. Foreo made a special version of their silicone facial brush in the Foreo LUNA For Men ($229 CAD). This man-specific model has "broader silicone touch-points" to tackle the thicker skin men often have. It promises a better shave in addition to leaving skin feeling cleaner and smoother than ever. Foreo LUNA is often thought of as a gentler Clarisonic, and would be a good option even for those with sensitive skin. I bought bf a konjac sponge that he likes a lot, and this would be a super-super-upgrade! American Eagle Touchpoint Gloves (~$17 CAD) is such a departure from the price point of the rest of the products in this guide, but would be a neat stocking stuffer. This is one of those gifts that I consider practical but cool: the touchpoint fingertips keep hands from freezing but still allow full use of a phone or tablet--ideal for when he's sitting in his car waiting for it to warm up, or standing in line for the bus in the cold. There are lots of options for touchpoint gloves available, but I picked these because American Eagle is in pretty much every mall in Canada and the US, and I have a pair of the women's version so I can attest that the touchpoint works perfectly. Reviews say the men's gloves run quite big, so if his hands are on the slender side, try the women's instead.